By Chris Williams: Former IBF/WBA light welterweight champion Amir Khan (29-3, 19 KO’s) says a fight between him and WBO welterweight champion Manny Pacquiao (56-5-2, 38 KO’s) would be a toss-up due to his size, height, and reach advantage over the 35-year-old Filipino fighter. Khan says he’s sparred with Pacquiao, and that he knows firsthand that he struggles against boxers. Khan was obviously being modest about what happened during their sparring sessions together, but we saw one of them on Youtube, and you could see that Khan was whipping Pacquiao worse than I’ve ever seen before. Even Juan Manuel Marquez never did to Pacquiao what Khan did to him during that sparring session. Khan went onto say that he really wants to get Pacquiao in the ring because he feels that would be a big, big fight if it gets made. He has no problems at all whatsoever with the Top Rank/Golden Boy thing, because he’s only got 2 fights left on his contract with Golden Boy. His adviser is Al Haymon, but he’s not his promoter, so that shouldn’t stop Khan from getting a fight against Pacquiao unless his old trainer Freddie Roach persuades Pacquiao from taking the fight. We’re already seeing that now, because Roach says that he told Arum that he’d rather see Pacquiao fight Danny Garcia than Khan, because he thinks Khan holds too much. I think what bothers Roach now is that Khan has become more like Andre Ward, and it’s very difficult to beat Khan now. His game is now more defensive than offensive, and that makes him tough to beat. It’s hard to disagree with what Khan is saying. 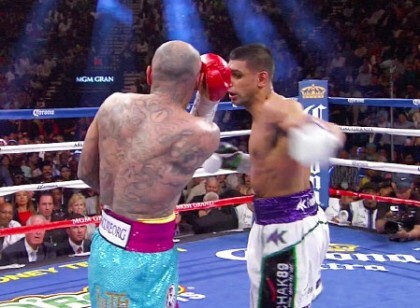 Khan is now far more defensive than he has ever been, and he seems to have thrown off all the useless stuff that was taught to him by Roach, and become more of a defensive master now that his new trainer Virgil Hunter has taught him how to fight properly from the ground up the way he did Andre Ward. It’s going to be interesting to see if Roach will keep Pacquiao from fighting Khan in order to protect him. If that fight never gets made than you have to assume there’s some fear there of what Khan would do to Pacquiao, because Khan absolutely wants the fight. He’s ready for Pacquiao.